Read 2 times. Last read March 14, 2019 to March 19, 2019. 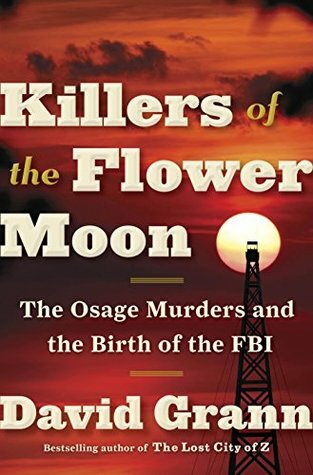 This history of murders of Osage Native Americans is well-researched and compelling. It kept my attention and provided more depth than I expected from a book about crime. There were some graphic scenes but nothing unnecessary to the theme of the book. What was most shocking was that there were people who thought so little of the Osage people that they felt entitled to kill them as if their lives didn't matter at all. What kind of people would do that? I was relieved that none of the criminals had my family names, since I had white relatives living just south of Osage County at the time... in the small town of Sand Springs, where today, there's a nearby Osage casino. I hope very much that nobody associated with my family was in any way involved with these terrible murders. The consciousless people who committed these crimes were self-serving, greedy, narcissistic animals. How greedy it is to not only marry a wealthy person, but then try to kill that person to inherit the wealth? Why wasn't living in wealth enough? I'm so glad the USA has, for the most part, grown out of the intense prejudice of the mindset of people who thought it was okay to force Native Americans to have white "guardians" to manage their finances. This whole scenario is beyond sick. I think if a person wants to waste their wealth that should be their business and nobody else's. The guardianship system caused years of opportunism as many guardians and their associates killed anyone they could derive a financial benefit from. The author's research into the work of the nascent Bureau of Investigations (now FBI) and the work of private investigators gives us perspective on their work, practices, and ethics. Very helpful and much appreciated. Sign into Goodreads to see if any of your friends have read Killers of the Flower Moon.